Jungle Flipping Hook- The Jungle Flipping Hook was designed to withstand heavy braided line use and the toughest of conditions. Made with Zo-Wire, the wire strength is stronger than other traditional high carbon steel wires. This means smaller hook wire diameters for better penetration and a Super Needle Point that will not roll over or dull. The eye is 100% closed to prevent knots from "slipping out". 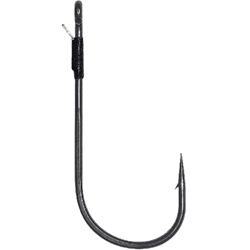 The bait keeper is meticulously wrapped onto the shank of the hook to prevent the keeper itself from sliding or spinning. Also featured is Owner's Silky Gray frictionless finish that encourages superior hook penetration and helps with bait clearance on hooksets.